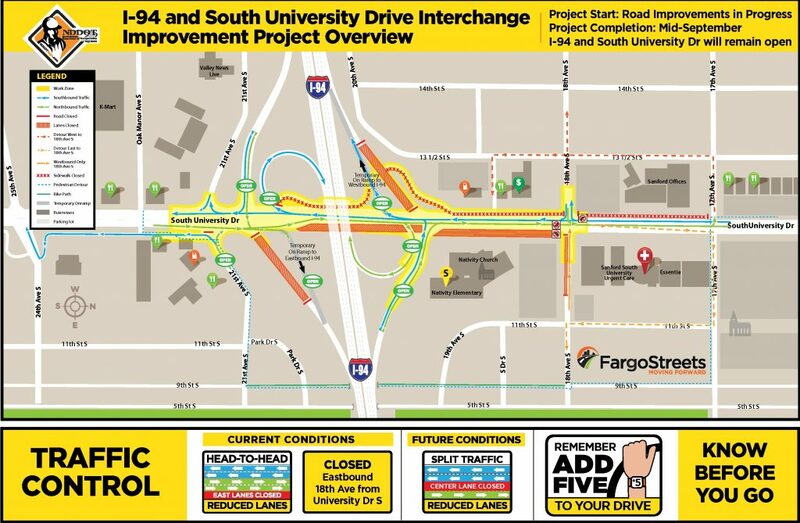 Next week contractors for the North Dakota Department of Transportation (NDDOT) Fargo District and City of Fargo Interstate 94 (I-94) and South University Drive interchange reconstruction project will temporarily detour one direction of intersection traffic within the north portion of the project limits. Starting Monday, July 9, the east side of the intersection at 18th Avenue South and South University Drive will change to a westbound only route through the intersection. The single lane of eastbound traffic will be detoured for the next two weeks to allow crews to work on the southeast corner of the intersection on storm sewer and additional utilities improvements. No left-turns will remain restricted for both north and southbound traffic at 18th Avenue S and South University Drive intersection. For northbound drivers, there will be no turning movements allowed on to 18th Avenue S during the intersection work. On the south side of the project, access to South University Drive from 21st Avenue South will be restored to northbound drivers starting on Friday, July 6. The reconstruction project work on the east side of South University will continue for the next month to complete removals, underground and paving operations. Traffic will then shift to be carried on the east side of South University Drive on the new concrete roadway. Crews will begin reconstructing the west side of the roadway. Once complete, traffic will then shift to the outside of each side of South University Drive in their respective direction of travel to allow crews to work in the center of the roadway. The sidewalk on the west side of South University Drive from 18th Avenue to under I-94 is closed to pedestrians as crews work on the northwest interchange quadrant. The detour for pedestrians is east of South University Drive by use of 17th Avenue S to 9th Street South to use the Lincoln Tunnel under I-94 to 21st Avenue S.
As a reminder, turning movements out from the west side business driveways and 18th Avenue S intersection access has changed with the head-to-head traffic shift. Currently two lanes of traffic are open on the west side of the roadway for both directions on the existing pavement. Crews are working on underground and additional utilities on the north portion east side of the roadway. Access to South University from I-94 remains open to both directions. Flaggers are present to assist with truck traffic moving in and out of the work zone. Motorists may experience brief delays. If an alternative route is available, motorists are encouraged to use these routes to help those traveling through or turning into driveways found in the work zone. Speeds are reduced to 25 mph.